Black Panther is more than just a hero; he is a king, a protector and a warrior. The history of Black Panther goes back thousands of years. To become Black Panther, one must participate in tasks that are both physical and mental, including defeating the current Black Panther in battle. If all the tasks are completed, the victor’s body is cover with the juices from the Heart-Shaped Herb; this herb, in legend, is said to be a gift from the Panther God. Scientists determined the herb was from a plant that had been mutated by a meteorite made of Vibranium. The Heart-Shaped Herb gives the power of the Panther God to the victor, granting them enhanced abilities and super strength. It is said that anyone not worthy or of noble blood would not survive the process. Thousands of years ago, a meteorite crashed into the part of Earth that would later be known as Wakanda. The primitive residents of this land believed that the Gods have given them a gift from the heavens. One of the strongest tribes, led by the great warrior Bashenga, investigated; upon reaching the crater they discovered a strange vibrating material and decided to use it to make weapons. However, as the tribesmen harvested the material, radiation started to spew from the meteorite, mutating a number of them into “Demon Spirits.” Bashenga prayed to the Panther Gods to give him strength to fight the demons. Whether it was the Gods or something that had been eaten, inhaled or absorbed by Bashenga, he obtained super strength and enhanced abilities and was able to defeat the demons. Bashenga would unite the tribes to form the nation of Wakanda, becoming its ruler and the first Black Panther. Years after Bashenga’s reign, King Azzuri claimed the right to call himself Black Panther. Azzuri and his wife had two children, T’Chaka and S’Yan. In 1941 King Azzuri and his son T’Chaka encountered Captain America and the Howling Commandos, who had travelled to Wakanda when they learned of a planned invasion by the Red Skull and Baron Strucker. Azzuri fought alongside his new American allies against a vast, super-powered Nazi invasion. They successfully defeated their enemies and Wakanda remained protected. 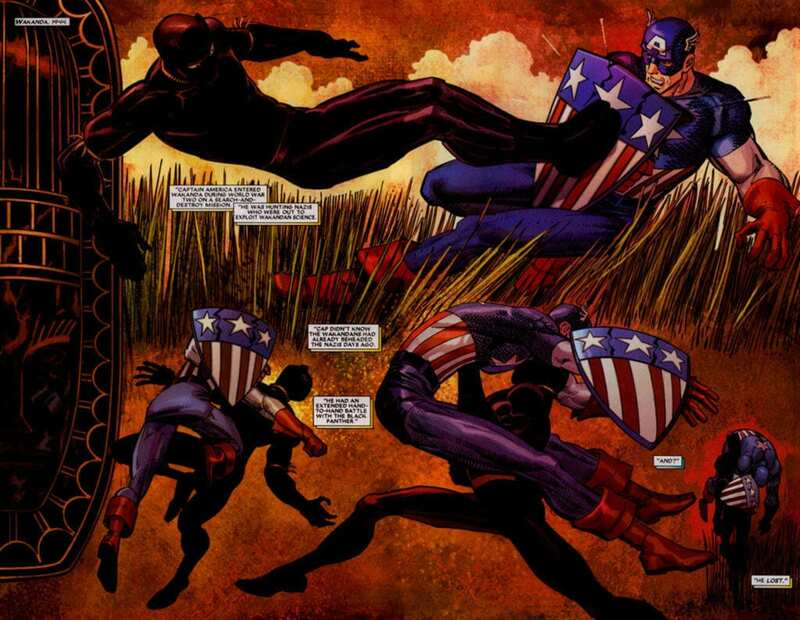 As a gift to Captain America, Azzuri presented him with a shield made of Vibranium. After the death of King Azzuri, his first-born son T’Chaka inherited the throne. From an early age he excelled as a warrior and fought to preserve Wakanda’s heritage, honoring old magic despite the technological advancements of his nation. T’Chaka still held an interest in technology and kept a balance between advancing Wakanda through tech and preserving the nation’s heritage. T’Chaka married a scientist named N’Yami, and together they raised an orphan boy named Hunter before eventually having a child of their own. N’Yami died shortly after giving birth to their son, who was named T’Challa. T’Chaka later remarried to a woman named Ramonda and had a third child, a daughter named Shuri. T’Chaka ruled over Wakanda as a righteous and great King for many years; his death came during a battle with Ulysses Klaw and a band of mercenaries hired by Klaw to accompany him on his search for Vibranium. T’Chaka’s firstborn son, T’Challa, watched as his father was killed in battle. Since T’Challa was too young to take his father’s place as King, S’Yan became the new leader of Wakanda until T’Challa came of age and claimed the throne and the mantle of Black Panther. Next week Superhero Spotlight shines on the significant comic book history of Black Panther and the origins of T’Challa. Was the son hunter ever featured in the comics?